My friends at Technique Tuesday emailed to ask if I’d help get the word out about their challenge to get cardmakers to actually send out their cards….sure! (See their post HERE) I love love love days when I mail out cards – I do send out tons. Lots to friends and family, but many many many to crafters (customers, usually) as surprise treats in their mailboxes. My patrons also get cards at least once a year…and that’s always a special day when I get to send them thank you notes. Technique Tuesday made a special set of stamps just for this challenge, and its nice and inexpensive, but you can sure use any stamps you already have for the challenge. I was sent a few owls too, and sentiments, and flowers (Thank you TT!) – so I figured I’d use them all in my cards to send out as random acts of cardness! For this challenge, I decided to work on a “set” of cards that’s “me.” Yellow. Copic. But simple so that I could make a lot of them! I even used 110 lb paper for these one-layer cards, to give them a little more “heft” to make it through the mail without getting all bent. Watch the video below or click HERE to see it in HD on YouTube. I need to check out the website. You truly have a good heart. Beautiful OLCs, love the surprise beautiful image on the inside! Great idea for spreading joy! I love both of those mailing sets. Just put them on my order. I love your creativity. I never would have thought to use the one stamp on the front of the card and the detail image in the center. Thanks for the inspiration. Priceless!!!!! Thank you for sharing – love your blog and videos Sandy always inspires me!!!! These are fabulous!! I like that the outside is simple but the inside is the prize. Such lovely cards!! 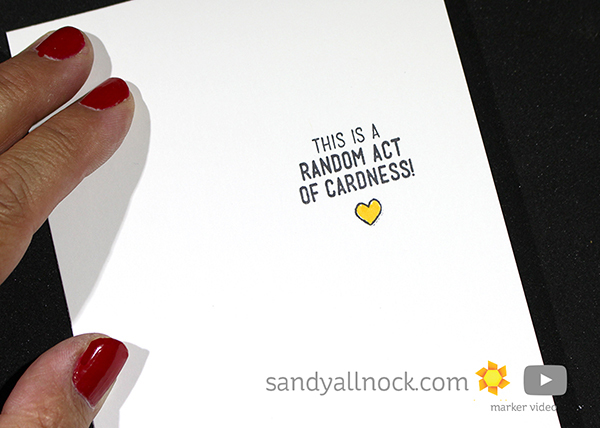 Just beautiful Sandy and sending random cards is a lovely thing to do! Beautiful cards! It’s always helpful to watch you Copic color. I’m so glad to see you feature Technique Tuesday. I really like their quality products and that they seem to promote CAS cards. 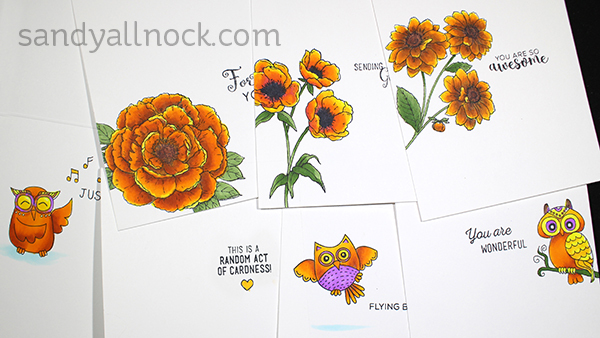 Such pretty cards and what a surprise in people’s mailboxes! Question though. Did your Copics not bleed through the cardstock? I know you used 110 lb. but I have sometimes used that weight and they still bleed. Secret please! What a great way to brighten someones day. I’m pretty sure most will have an idea their card is from you and that makes it extra cheery. TY for sharing your quick coloring and I hope you also receive “happy mail”. Not too much to say other than what a wonderful idea and beautiful coloring!! Sandy, even though you call them CAS, they are so well thought out and gorgeous!!! Beautiful series of cards! I’m sure receiving one would make anyone’s day brighter. You and Technique Tuesday are right on the mark with this one – I, for one, am guilty of saving WAY too many of my cards, to keep me company – or something. I don’t know why I won’t part with them! This would be a terrific way to send a card, without worrying about any certain occasion or holiday – thanks for giving me “permission” to send a simple card without even identifying myself… this I think I could do!!! This is such a wonderful idea. And, as usual, your cards are stunning. The recipients are sure to be filled with joy. I’m sure it won’t take long for them to figure out who sent it. My post office will not let me send ANYTHING without a return address AND a name so doing this anonomously wouldn’t work for me. So cool! What a great idea! The stamps are adorable! I am both a patron and a customer; fingers crossed What should recipients use as a hashtag on Instagram if they do receive one and want to post a photo?